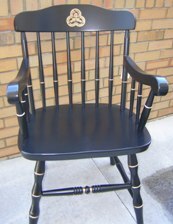 All black satin lacquer Captain's chair with 28 gold striped highlights applied by hand, all around the turning. Screen printed seal on back. May be personalized with a brass plaque or screen printed at an additional charge. Additional shipping charges apply. Allow 4-6 weeks for delivery. Phone 517-607-2266 to place order. (Also available in other finish color choices). Price subject to change.